FREDERICK M. GEORGE*, a Union veteran of the late Civil War, and the oldest justice of the peace of Cambria county in years of service, is a son of Paul and Margaret (Corigan) George, and was born on the old George farm, in Washington township, Cambria county, Pennsylvania, February 23, 1824. His maternal great-grandparents, Peter and Nevy Corigan, came from Latrom, Ireland, and settled in Loretto, Pennsylvania, where they died at greatly advanced years, and his great-grandparents, the Georges, came from Holland, Germany, and settled in Maryland, where they reared a large family. Their grandson, Philip George, became the founder of the Pennsylvania branch of the family. Philip George left Maryland, and after stopping for a while in Bedford county, he came, in 1811, to the Turner farm, near Ebensburg, where he was engaged in farming. In 1821 they moved to Washington township, Cambria county, where they died at a very old age. Their son Paul** was born in Bedford county, Pennsylvania, October 26, 1796, and after receiving the limited education of that day, turned his attention to earning a livelihood and some means of support. He was married by Rev. Prince Gallitzin, at Loretto, Pennsylvania, on September 16, 1817, to Margaret Corigan, a daughter of Peter Corigan, who was born in Huntingdon county, Pennsylvania, July 16, 1794, and died on the old homestead August 15, 1874. After marriage they lived near Cresson, Pennsylvania, where he made a section of the Huntingdon and Pittsburg pike. On completing this they moved to Blairsville, Pennsylvania, where he made another section of the same pike. He at that time owned the present site of Blairsville, and sold it for seventy-five dollars and returned to Cambria county, where he and his father, Philip George***, purchased two large tracts of land in Washington township, and cleared the land for a farm in 1820, and this has since been the old homestead, but much of it is now sold in town lots. He followed farming and butchering, and supplied the contractors of the old Portage road with fresh meats in 1832. He carried the mail on horseback from Huntingdon to Pittsburg in 1812--during the war, when great excitement prevailed in the latter place. His grandfather, Peter Corigan, and grand-uncle, Paul George****, served full terms in the Revolutionary war, and his grand-uncle, Michael George*****, served in the War of 1812. He was one of the most prominent men of his time in the community where he resided. He was a thoroughgoing and enterprising business man, liberal in the support of worthy causes; he was one of that class of men who, by industry, self-reliance and judicious management, secure a fair competency and at the same time fulfill every duty of an honorable and useful citizen. He was an old-line whig and later a democrat in politics, and for many years had been a devoted member of the Catholic church. He never aspired to position or place, but served as school director, besides holding other township offices, and died October 30, 1870. Their children were: Elizabeth, who married Hon. Thomas H. Porter, and is now deceased; Mary, wife of Wm. McGough, and now dead; 'Squire Frederick M.; Philip P., now deceased; and Prudence M., Rachael C. and Peter P., who are still residing on the home farm. Frederick M. George, the oldest George now living of these generations, was reared on the home farm, and attended the early common schools, but is principally self-educated, and has always been a great reader. His early life was spent on the farm, and after serving, from 1845 to 1847, as constable of Washington township, he was engaged for three years in studying and teaching vocal music. In 1851 he opened a store and a hotel at Lilly. He conducted the store until 1861, when he patriotically scarified business interests to serve his country in her hour of need. He enlisted in the Fifty-fifth Pennsylvania Volunteer infantry, and was made quartermaster of the regiment, which position he held for over three years. He participated in all the engagements of his regiment in South Carolina and Virginia. Returning from the army, he turned his attention to the improvement of his property at Lilly, Pennsylvania. He was appointed as agent of the Adams Express company, and held that position from July 16, 1868, to July, 1895. He is now serving as justice of the peace, having held that office continuously by re-election from 1852, excepting the four years he was in the Union army. 'Squire George married Mariah J. Curran, who was a daughter of John Curran, of Johnstown, Pennsylvania, and died March 21, 1848, aged twenty-two years, leaving one son, Robert L., who is now an attorney-at-law of Gallitzin, Pennsylvania. Some years later on 'Squire George married Mary A. Sweeney, a daughter of John Sweeney, of Lilly, and by his second marriage has two sons: Fletcher C., now actively engaged in mercantile business, and Lambert E., assistant postmaster at Lilly, Pennsylvania. In politics, 'Squire George has always been a strong democrat, and early in life took quite an active interest in local politics. He is a worthy and useful member of the Catholic church. He is a prominent as well as one of the oldest citizens of Lilly, where he has resided all his lifetime. 'Squire George is an example of success, which is the result not so much of early or fortunate surroundings as of self-reliance, energy and a steadfast devotion to the principles he espoused at the commencement of his career. His record is one of industry, activity and honor. COMPRISING ABOUT FIVE HUNDRED SKETCHES OF THE PROMINENT AND REPRESENTATIVE CITIZENS OF THE COUNTY. 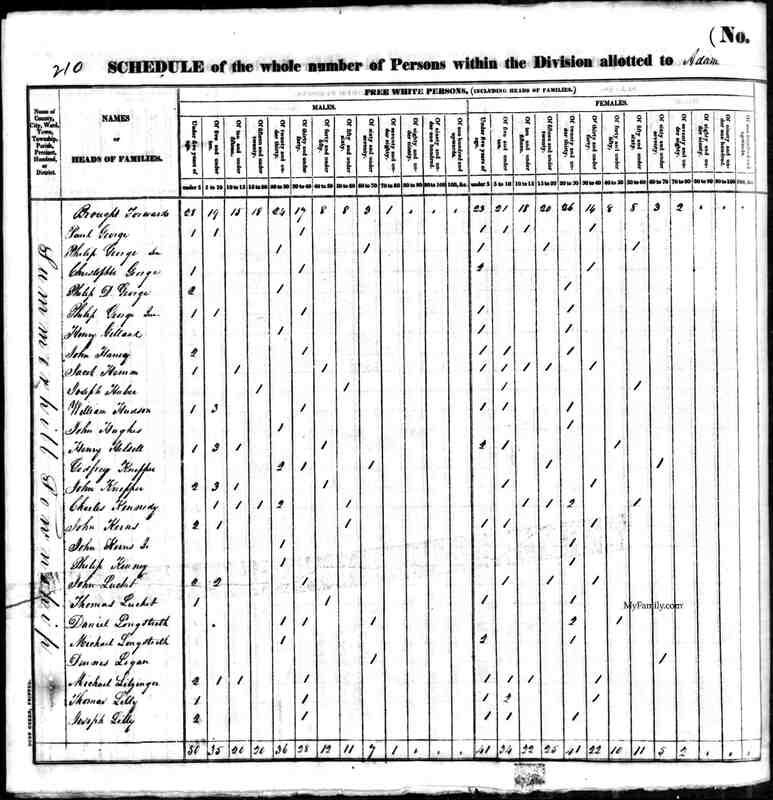 The Ages for the George families do not add up to match this census. For example, Paul George is the Brother of Philip George, if his birth date is really 1761, he would be 68-69 in 1830 not 50-60. Now he may have placed X in wrong Column or this may be the wrong Paul George however, this is unlikely because the historical records at the time show no other Georges in the area. The first Philip on the list is Philip D son of Philip son of Albright. The rest on the list are their children.